Earth scientists in the College of Arts and Sciences have received a major grant to test a new technique for measuring tectonic uplift. 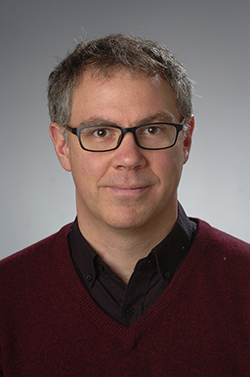 Gregory Hoke, assistant professor of Earth sciences, and Devin McPhillips, a postdoctoral research associate, are the recipients of an Early-Concept Grant for Exploratory Research (EAGER) award from the National Science Foundation. They will use the $147,000 award to determine whether or not cosmogenic nuclides— isotopes produced in minerals during exposure to cosmic rays—determine shifts in elevation of slowly eroding South American mountain landscapes. Hoke calls the one-year grant, awarded by the NSF’s Tectonics and Geomorphology & Land-Use programs, a “proof-of-concept study.” He says that all current paleoelevation studies rely, in one way or another, on past atmospheric circulation patterns. “That’s their ultimate limitation,” he adds. The goal of this study is to create a novel paleoaltimetry tool that accurately measures paleoelevation and surface uplift rates all over the world, independent of atmospheric circulation. 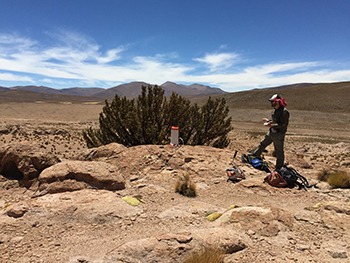 Already, Hoke and McPhillips have used the EAGER grant to travel to South America to collect an array of rock samples from the western flank of the Andes Mountains and from the western edge of the Andean Plateau in Bolivia, Chile and Peru. The samples are from elevations between 2,625-14,764 feet (600-4,500 meters). Their next step is to analyze the samples with Hella Wittmann-Oelze and Samuel Niedermann, researchers at the GFZ German Research Centre for Geosciences in Potsdam. If their efforts are successful, Hoke and McPhillips may resolve a long-standing debate over the timing of the Andean uplift. “Our goal is simple: to determine if the mountains rose quickly over a short period of time or if they underwent a slow, progressive topographic growth,” Hoke says. He and McPhillips also hope to understand how their method performs over a range of uplift rates; how increasing the number of samples reduces uncertainty; and how their method is consistent over various timescales, with different isotope pairs.